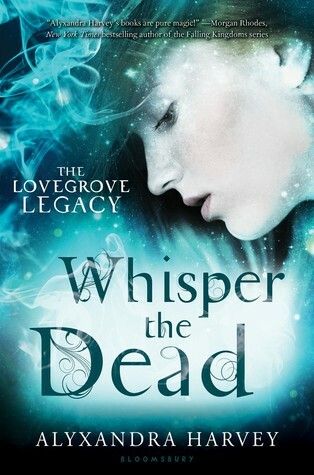 I am not gonna lie, I don’t have as clear an idea of what happens in this book as I did with the first book in the series, A Breath of Frost but Whisper the Dead was just as fun. I really am enjoying this new series because each book has been a light, funny, romantic read. And the characters are fantastic – it’s like Libba Bray’s A Great and Terrible Beauty without all the bleak social commentary (although there is a huge amount of social commentary in this series, it’s just that Harvey approaches it with humour). So Whisper the Dead switches up narratives and is told from Gretchen’s POV. One of the many things I am loving about this series is how distinctive each character is and Gretchen is such a great example. Unlike Emma, who narrated the first book, Gretchen’s powers aren’t elemental or physical – she hears the voices of the dead and a huge part of this book is about her learning to accept this about herself and using her powers to her own advantage. Gretchen is clever, unscrupulous and she has no time for the patriarchy – something that is evident in the way she consistently speaks out and never tries to make herself fit into the confines of social propriety. She is so much fun as a narrator because her voice is so disparaging; Gretchen’s sarcasm is softened by her love for her family and the people she grows to care about in this book. The other characters are also fabulous and so well developed. I loved the romance just as much as I did in the first book; Gretchen and Tobias are so antagonistic with so much UST and it’s like all my favourite things to be honest. I did spend a lot of time clutching my Kindle going ‘now KISS!’ in all their scenes together. A girl has needs, okay. I also loved the continuation of the relationships that took centre stage in A Breath of Frost – Emma and Cormac, for example, nearly killed me in that very last scene. I really found myself caring about Penelope and Colin (my Kindle’s too far away to check if that is actually his name but let’s just go with it); he was sweet and protective and they’ve got that angsty will they/won’t they vibe going on which is good because y’know, again, a girl has needs. The plot is kind of basic in this sequel, I think. A Breath of Frost introduced us to the obvious villains of the series, and Whisper the Dead does reference them but the main conflict comes from a character who was kind of a lame sidekick in the first book, so I was a bit eh about the whole thing. I was also not that interested by the werewolf stuff but although none of it gripped me in the way the first book did, the plot is still sufficiently interesting enough to keep you wanting to turn the pages to find out what happens next and I’m pretty okay with that so long as the next book ramps it up a bit. Oh and also, that one terrible twist was cruel and I’m not accepting it as canon thank you and goodnight. But seriously, this was a fun, cute read that I really recommend to anyone who’s not put off by historical fiction and enjoys sassy female characters.